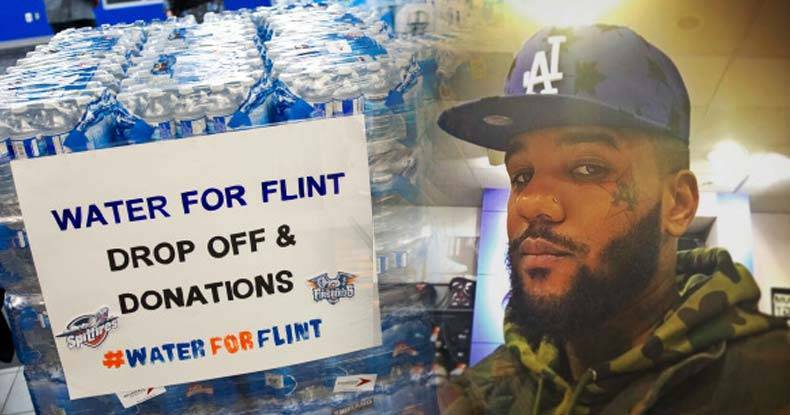 Flint, MI – In the midst of an overseas tour, rapper The Game took to Instagram to announce that he was making a $500,000 donation to assist in providing bottled water to residents of Flint, Mich., in the midst of the city’s ongoing major water crisis, according to the Michigan Chronicle. He added that the bottled water company Avita Water will match the $500,000 donation – making for a total of one million dollars in bottled water being sent to Flint on behalf of The Robin Hood Project, the rappers charity. The former G-Unit rapper made note on Instagram that this issue was personal to him, as he has family that lives in Flint and are unable to use the lead-contaminated water. “…my younger sister & her children live there & 2nd because I care… Most of these celebs on here faking using the word ‘Pledge’ in their so called donations are not fooling anyone!!! !” the rapper wrote in a lengthy Insta-post. He also challenged celebrities Madonna and Jimmy Fallon to step up, noting their “cute” $10,000 dollar donations. The Game also revealed that the initial water shipments from Avita were scheduled to begin arriving to the Flint area on Wednesday. The residents of Flint undoubtedly appreciate the charitable efforts of the superstar rapper in not only helping to bring fresh water to Flint, but also in challenging other celebrities to step up financially. The Compton rapper has set the bar high with his donation and deserves to be commended for using his celebrity to forward an extremely righteous cause. Will any other celebrities accept The Game’s one-million-dollar donation challenge? Let’s hope so. Check out his full post on Instagram announcing the $1,000,000 bottled water donation below.